An English Homestead: That's Not A BBQ!! When I barbecue I'm somewhat of a purist, I think it should be over hot charcoal (locally sourced of course), so the meat takes on the taste of the smoke. So the thought of buying a gas BBQ has never entered my mind. But this was an offer too good to turn down. 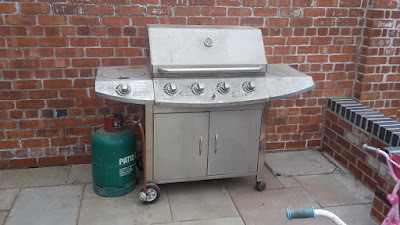 A friend's parents had a gas BBQ that they hadn't used in a few years so they've lent it to us for the summer. Like I said I've never used a gas one so I'm a little dubious, but I am looking forward to being able to quickly cook outside without having to plan to light the BBQ half an hour or so before I need it, I'm thinking it'll give me a quick an easy outdoor cooking area for this year and keep me out of the kitchen in the (hopefully) hot summer. It also has a gas hob which I think would be good for stir fries with veggies straight out of the garden. What's your opinion on gas BBQ's? Do you own one and use it very much? Hi Kev :) I'm a purist too. We have a charcoal bbq. I love the way it flavours everything you cook. I know that a gas bbq speeds up the process, but honestly I don't find it makes it taste anything different than cooking something in the oven. But...having said that, in 2013, my boyfriend's great aunt GAVE us a gas grill, like yours but in black. We did use it and it was quite convenient, though I never really thought it was great. Last summer, we realized that the feral cats in the neighbourhood were using it as their home and bathroom, ick...and we had to toss it. We are back to charcoal now and I couldn't be happier! I love, love, love our gas bbq. It is so convenient. We live in W. Canada where the temps can go anywhere from the minus 30s to the plus 30s. Because we have the bbq on a covered patio we bbq year round, doesn't matter what the weather or temperature. We have a tradition of bbq'd steak and lobster tails on New Year's Eve, no matter what! We have done the charcoal, the propane and now we have the bbq connected to the house natural gas. I love the flavour we get on the food. It looks like yours is propane-make sure you don't run out in the middle of cooking-good idea to have a full spare tank. I hope you enjoy it!! Hi Kevin; Want some low and slow cooked food like chicken, ribs, etc.? The Gas grill is your friend. Want some nice smoky flavored but quicker cooking meat such as lamb or beef steak, veg kabobs, hamburg patties, whatever? Then we pull our out our small charcoal grill and indulge. Janice is so correct. If it is cold or less than great weather conditions, the gas grill is tops. We use both. The gas is quick and easy - and the food is very good. The real thing is slower and much much better tasting. But, all things considered for us, it is a question of gas/quick or not at all sometimes. Life's compromises. You can do both. At home, Daddy grilled over charcoal. When I married, we never had one because husband did not want to cook at all. My son won a propane bbq grill when he was 12, so we had that and I had to cook and care for babies, kids, and do indoor cooking dishes, too! It was just a pain. Then after divorce, I broke down and bought another gas grill gas grill on sale and guests cook sometimes. I love it! I can cook on it, but am not able to go up and down the stairs much. So, it is just a huge trophy...bought on sale, of course, at the end of the summer. We use either charcoal or vine prunings. Gas I reserve for indoors. You should see the BBQ my son-in-law has in Oz.... it's HUGE. Hi Kev. We have always cooked on coal. Jon built us a bbq at our last house but we now have our fire pit which we have ALWAYS wanted surrounded by the log seating from trees taken down in the garden. Nothing like the smell of coal on a bbq, for me gas doesn't add anything, but that is just me. 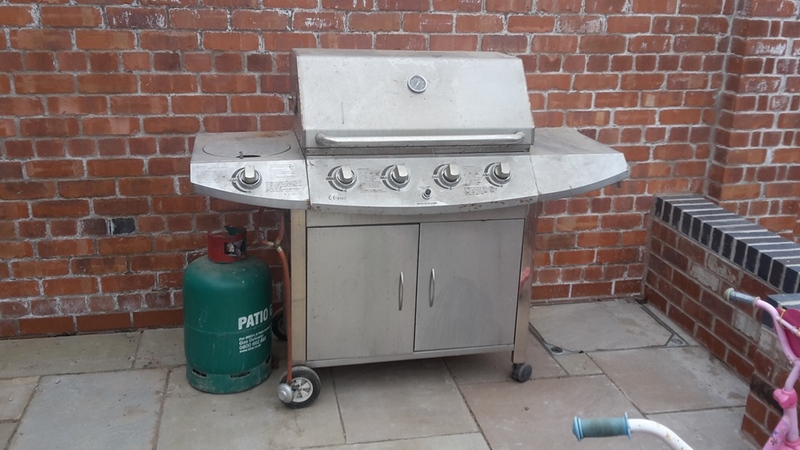 We have a huge gas BBQ, and would not change, we can set it going and be enjoying our food in the shortest of time, so we have more BBQ's than with our old coal one. We have a gas BBQ, invaluale when having a new kitchen. I BBQ all year around. The last neighbours thought I was a nut as I was out there with an umbrella and was cooking. The burner on the side is useful for everything. But we use it to make flat breads with a cast iron flat griddle. YUM! and people think you are the best chef ever, making fresh hot bread to go with the BBQ dinner! Shh I am letting all of my secrets out now!!!!! No room in the oven Christmas day? no problem BBQ the turkey. That is what my parents do. We grew up with a Weber grill & of course, back in the 70s, charcoal was the norm. Flash forward to today & the hubs and I use a gas grill. As has been mentioned already, the convenience of using gas cannot be understated. --any weather & not a long wait time for the grill to heat up. We've had both and prefer charcoal as far as taste goes. That being said, as long as my husband is cooking and not me i could care less what he's cooking over. We use gas, but as Cottontail said, as long as hubby's cooking, it's fine by me! That extra burner was a Godsend when I first started pressure canning and didn't want to heat up the house in the summer. For my birthday one year, husband built me a "summer kitchen" (in the US Midwest) outside with an old side burner from a used up gas grill with a 4 foot counter top for prep and jar cooling. Overall, while charcoal is great (remember, so are wood cook stoves), gas is quick...an advantage with hungry kids and multi-tasking side dishes!